Reverse Tonnage - Part 1: Are You Beating Your Press to Death? In this multipart series on Reverse Tonnage also referred to as “Snap-Through” we will examine the root cause of this issue and its adverse effects on both your press and your tooling. These printable log sheets will help organize and streamline your internal maintenance checks for your presses. Trenton forging adds to its capabilities and focuses on continuing education to remain a leader in closed-impression die forgings. 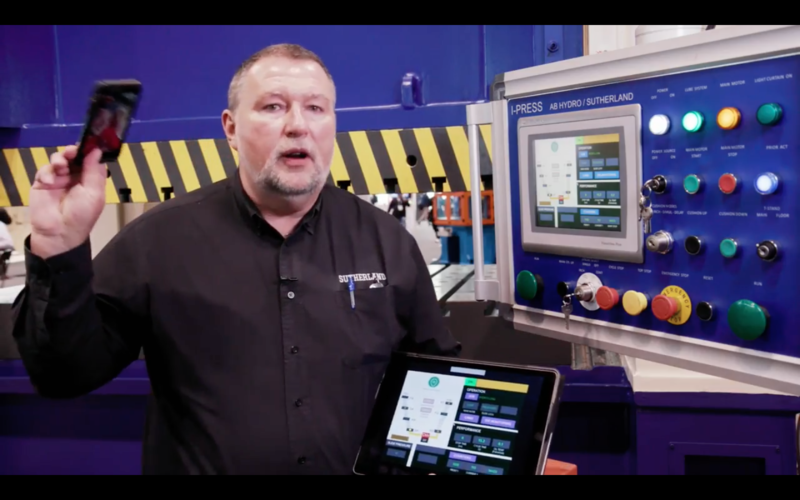 At FABTECH, Sutherland introduced its new I-Press AB Plus control, kicking its I-Press control, introduced in 2011, up a notch. 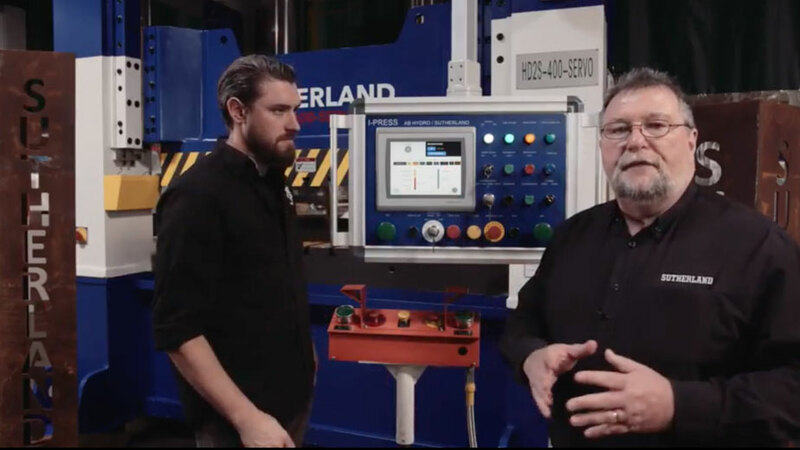 Mark Sutherland, president of Sutherland Presses, explains how to protect your investment. Eccentric Plunger Guided Straight Side Presses are by far the strongest and most precise stamping presses the industry has to offer. 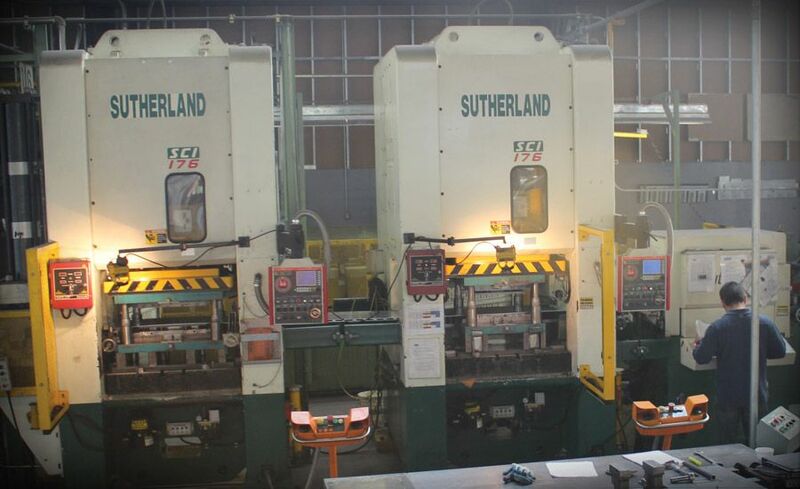 Sutherland Presses offers a full range of Servo Driven Hydraulic Presses from 100 to 3000 ton. The advantages with our Servo Hydraulic system include, faster speeds, full adjustable speeds, adjustable pressure control and adjustable travel of slide or cushion stroke. The Connected Enterprise represents a paradigm shift in manufacturing that is equal to the shifts that occurred with the adoption of the computer, and the development of the internet. The KS2-SERIES "Apex Center Drive" two point straight sides are ideal for large die areas when off-center loads are or may be present. GAP FRAME PRESSES JUST GOT A LOT COOLER, MARK SERIES "GENERATION II"
2016 is a big year at Sutherland, as we are celebrating our 70th year and extremely proud of our new "GEN-II" MARK SERIES single point gap frame presses. SMALL BED PRESSES FOR HEAVY LOADS - Forming, Forging or Hot Heading often times requires a lot of force in a small concentrated area. The I-PRESS control was originally developed by Sutherland Presses in 2011. The thinking behind it was to deliver a press & control that would be ready right out of the box for both single hit and automated operations. What do you get when you put the Best Press Company & Trucking & Rigging company together ? One Awesome Alliance !! New California Customer Prep Center in La Mirada California. The 1600 ton Sutherland Hot Forge Press below was just signed off and accepted by one of our customers in Mexico. This is a great example of our mid size hot forging presses. Click Here to see our full range of Hot Forge, Cold Forge and Hot Heading Presses. 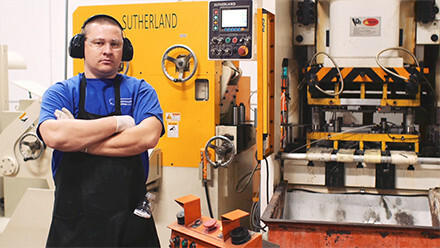 Based out of California, Sutherland Presses is heading for it's 70th year in business. Three 3 generations, an incredible team of co-workers, knowledgeable distributors and superior service partners, the people make the difference. Ever since former NBA star Mitch Kupchak (current Los Angeles Lakers general manager) first donned a knee brace manufactured by Townsend Design, sales for the company have skyrocketed. Our small press facility (330 ton and below) is on target for one hundred (100) presses per month. The key to this is our ability to pull frames and components from our inventory. 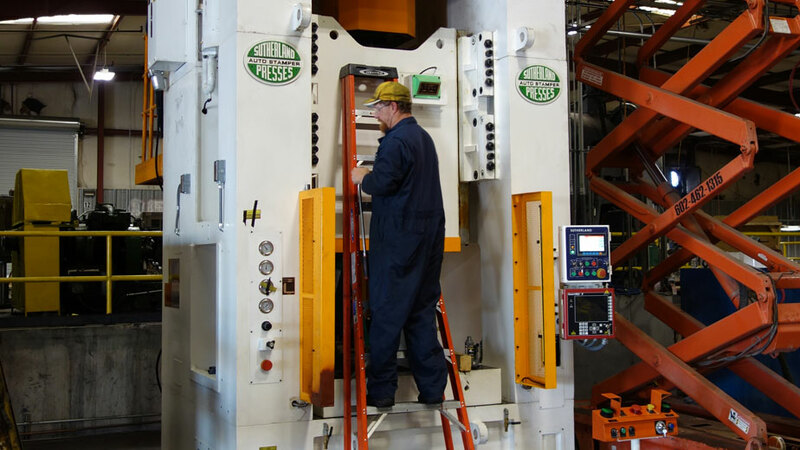 Another common and overlooked area on stamping presses: is the air supply and exhaust system for the clutch & brake system. In most cases the air supply and clutch brake units are up high and protected with guarding, reason for being overlooked. This is a great visual tool for an inside look into Metal Stampings, Hydro formed and Forge Parts. In todayâs efforts to make automobiles more fuel efficient, lighter and safer, creates many challenges for automobile makers and component suppliers. 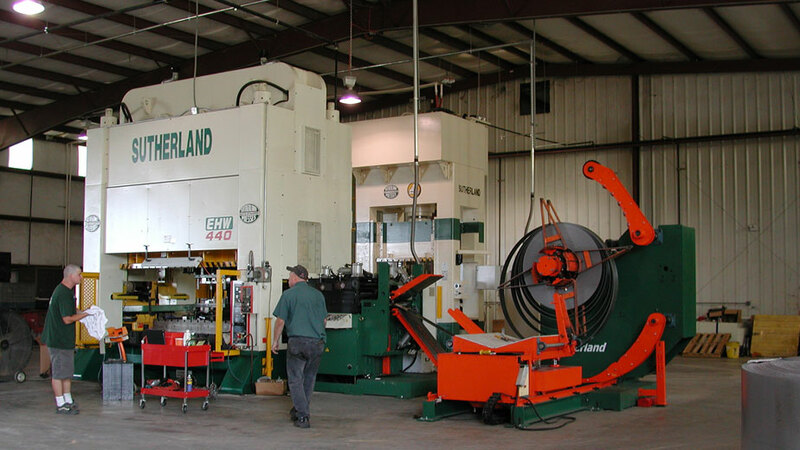 SUTHERLAND PRESSES, Los Angeles & USEF / US EQUITY FUNDING, Boston have formed an alliance to offer competitive leasing packages for all Sutherland metal forming and processing equipment. Improperly adjusted Air Counter Balance Pressure will cause excessive wear and damage to your stamping press. Crazy, when you think about it, that a component that cost less than $50.00 creates damage that can cost tens of thousands of dollars in damage? 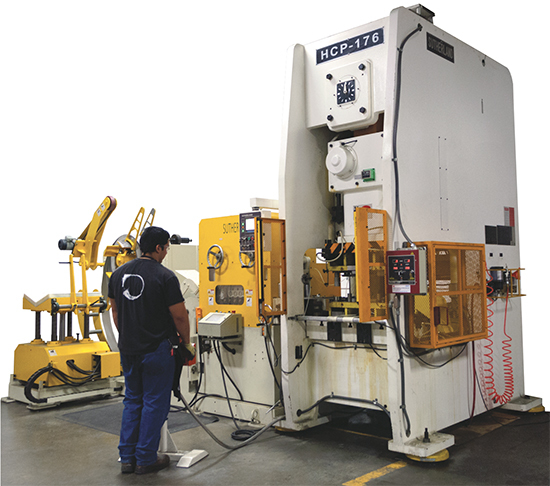 We are the pioneer of Pacific Rim metal forming lines dating back to the late 1950's. We are specialist in Metal Forming, Stamping & Forging processing lines.